Don’t let hair and skin care damage get worse. 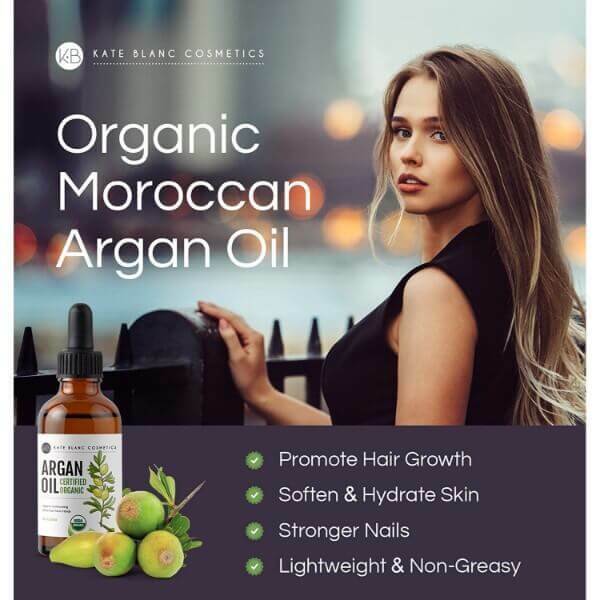 Here is a treatment and prevention all in one bottle of Kate Blanc Cosmetics Moroccan Argan Oil. 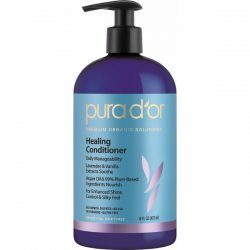 Natural hair care products such as this often contain extracts that nourish hair and scalp. 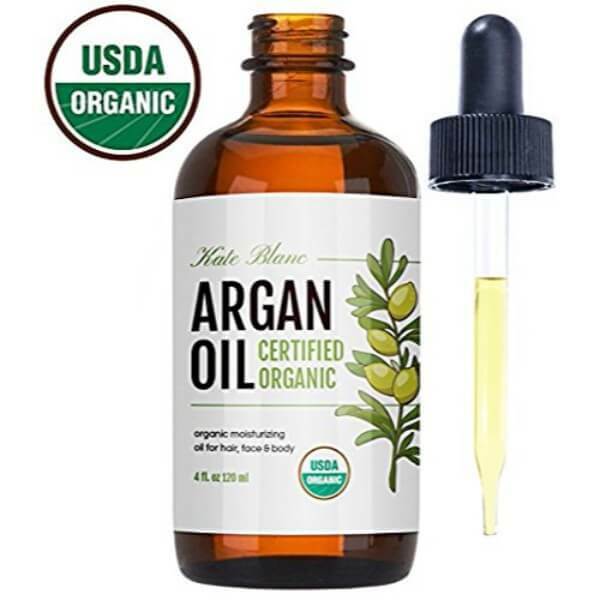 Argan oil, in particular, is popular because of its moisturizing properties. 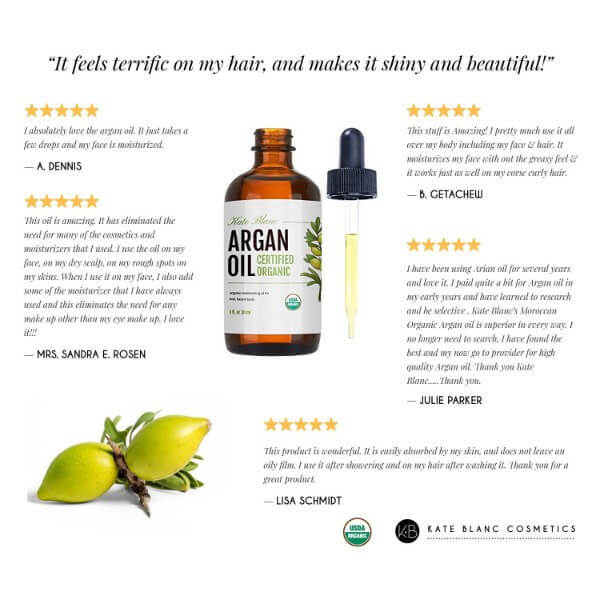 This pure organic oil provides moisture and nourishment to restore the softness of the skin and shine of hair. Kate Blanc Cosmetics argan oil is extracted from high-quality ingredient, which provides rich amounts of moisture and nourishment. It restores the health of skin, hair, and nails. It packs antioxidants that slow down skin aging and prevent damage to hair and skin too. Moroccan Argan Oil promotes healthy hair growth to replace dry and damaged hair. Applying it to scalp helps provide moisture that balances the production of oil on scalp. It helps alleviate symptoms of dry scalp while improving hair elasticity. Regular application of argan oil to hair makes it more resilient against breakage. It treats damaged and brittle hair. This natural moisturizer is good for face and skin. It absorbs deep into the skin to provide hydration that prevents skin from getting dull and dry. 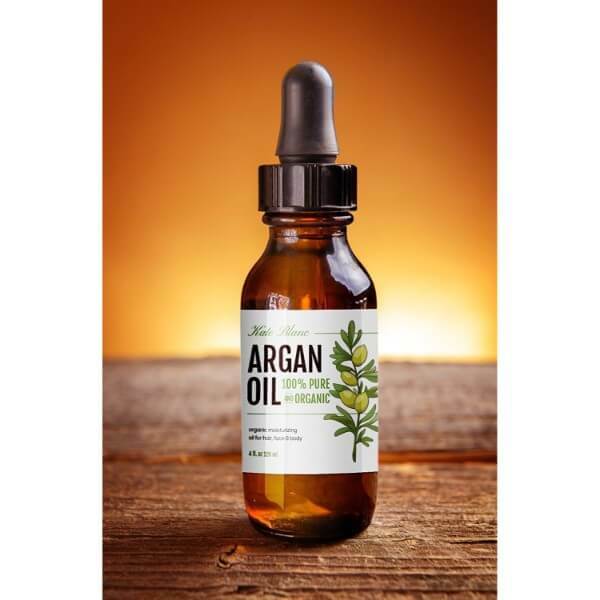 Argan oil soothes inflammation as well to keep skin smooth and soft. It helps reduce the appearance of dark spots and acne marks too. 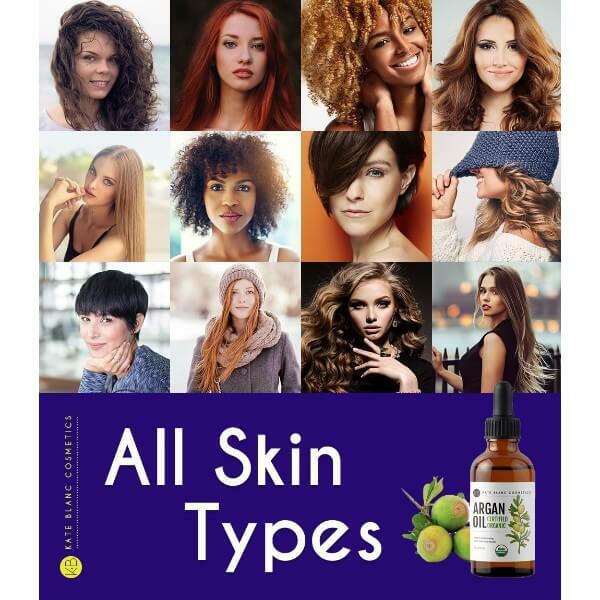 The antioxidants in vitamins in Argan oil works to improve skin texture and tone. Regular use fades wrinkles and fine lines gradually. It is good for all skin types as a nighttime moisturizer. The oil works as a nail drop as well. It strengthens nails and softens cuticles to ensure that healthy growth of nails. Kate Blanc Cosmetics imported the finest ingredients from Morocco to ensure their quality. This product contains nothing but pure argan oil. The brand did not use any filler or chemical that may be harmful to the user and environment. Experience the great benefits and wide uses of this oil. Get a bottle now! 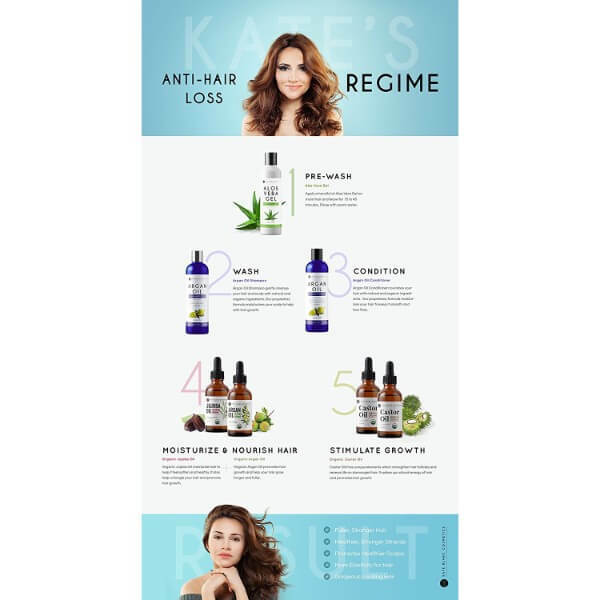 Mix with hair products or use as an oil treatment for hair. Apply 3-5 drops of oil and massage from scalp to the tips of hair. Leave it on for a few minutes before rinsing off with lukewarm water. Do this once or twice a week to soften hair. 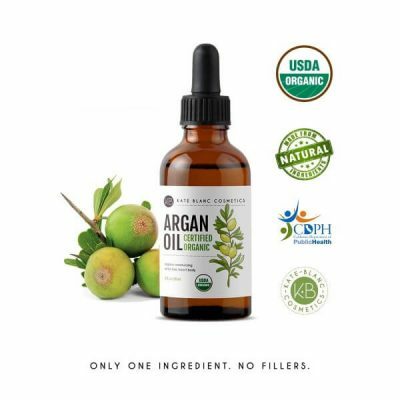 Mix the argan oil with skin care products or use as a lightweight moisturizer. 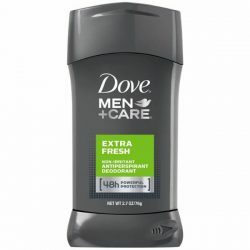 Apply to affected areas during the night and rinse off with a gentle face wash in the morning. To strengthen nails, use as a nail drop. Put one drop of oil to each nail and spread. Let it absorb and wipe off excess oil. 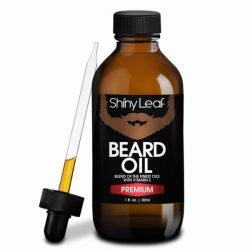 Use regularly for great results.